Posted on February 9, 2014 by Ching under Travel, Zumba. I missed mentioning the Burlesque and Fierce Funk workshops that I took on day 1 of the conference because I didn’t have any photos. My phone ran out of battery. Burlesque was awesome. Gina Grant taught it along with Betsy Dopico and Melissa Chiz. They showed us five Burlesque routines. I wish there were choreo notes because I can’t remember any of them to save my life. They were super fun, though. Fierce Funk with Pepper Von was great too. 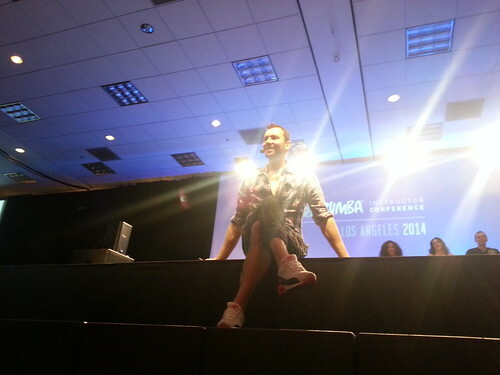 Check out his Fierce Funk web site for links to music and choreography. So those two workshops happened between the kick off session and the Augie’s Quest fitness concert. The fitness concert was great but it wasn’t half as good as the one in Orlando. It was still a lot of fun, though. 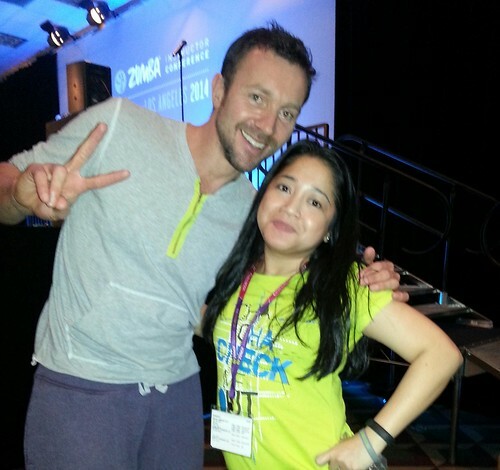 Day 2 consisted of Zumba Pro Skills with Steve Boedt. He is beyond amazing. Seriously. What a treat too because Gina Grant, Donna Giffen, and David Velez all helped with the training. 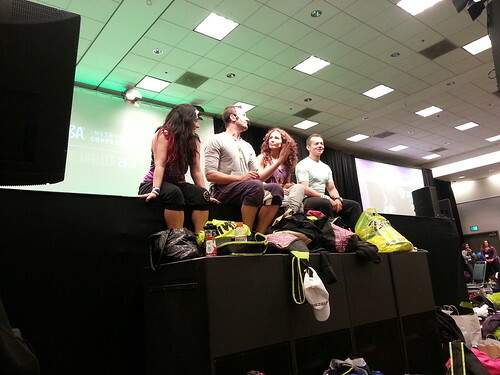 How many people can say they took Pro Skills with four of the best Zumba Education Specialists? LOL. And the best part? I was third in line so I was front and center during the training. In other words, I was in the splash zone. Literally. Steve sweats a lot. I actually got some of his DNA on me and I almost didn’t want to shower at the end of the day. Here are some of the photos I took during training. This is where he showed us how the A/V team used condoms to keep the mic receivers from getting gross. I guess condoms were the best way they could think of to keep sweat and dirt off the technology. Interesting. This is my favorite photo of the day. For obvious reasons. Here’s a picture of the theme party. This one wasn’t as cool or as fun as the one in Orlando. There were entertainers working the crowd. No photo booth. No face painting. The conference hall decorations were sparse. Actually, other than the lighting, I’m not sure there were any. No big name performers. Not even an impersonator. LOL. The party was fun but pales in comparison to the theme party at the 2013 Zumba Instructor Convention in Orlando. If you guys get a chance, I highly recommend attending the conference first before attending the convention that way you’re building up. After attending the convention, you have such high expectations that it’s hard not be disappointed. The event itself was fantastic and the trainings and workshops were high quality but the fitness concert and the theme party were not as elaborate as Orlando. That’s all.